This week over at I Heart Faces it is Prop Week. For this week’s photo challenge we’d like to see how you incorporate a prop into your portrait photo. It can be a simple prop addition or it can be a photo that was taken in a completely stylized session…either way is absolutely fine with us. 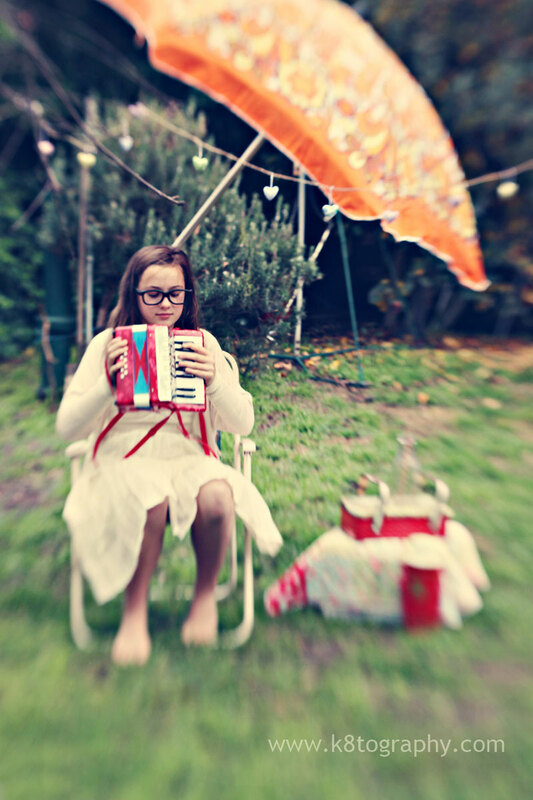 I did this stylised shoot with my daughter not too long ago in our back yard. The shoot was Prop Heaven! I found the fab 70's Beach Umbrella on Roadside Junk along with the red biscuit tin with handles. I strung hearts on our nectarine tree branches, used 3D movie glasses as nerd glasses and the Piano Accordion that we picked up at a market for $2. I love the way the whole shoot turned out. I love the colours and the 'retro-ness'. She had fun too! It was painless for her - over in 10 minutes - I have to move fast as far as my kids are concerned with photographing them now. Sad. The lens I used for this was my Lensbaby 3G (or the Control Freak). Please head on over and check out the many fab Prop images from all over the world over at I Heart Faces!